Based on her widely acclaimed card deck for children, mindfulness and yoga expert (and parent), Jennifer Cohen Harper, with Mayuri Gonzalez and Argos Gonzalez, have created a deck especially for teens to support a more balanced and healthy life. 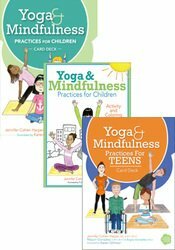 Yoga and Mindfulness Practices for Teens Card Deck offers over 50 practices to help teens become stronger, more flexible, get better rest, manage anxiety and learn to navigate stressful situations without becoming overwhelmed. Beautifully illustrated by Karen Gilmour, coupled with easy-to-read and easy-to-implement instructions. Divided into five elements, Connect, Breathe, Move, Focus and Relax, along with partner and group practices, this card deck is a comprehensive yet accessible tool kit for teens themselves, as well as for parents, teachers, clinicians, coaches and others interested in helping support self-awareness and increased personal power in young people. Argos Gonzalez, M.Ed., is a teacher, lecturer, and mindfulness and yoga instructor. He has 13 years of experience teaching high school in the Bronx and teaches pre-service and in-service teachers at Hunter College School of Education in NY. Argos is certified through both Mindful Schools and Little Flower Yoga (LFY), and currently serves as the director of professional development for The School Yoga Project, a program of LFY. Argos was a contributing editor to Best Practices for Yoga in Schools (YSC-Omega, 2015), and his work has been featured in national media including NPR and The Atlantic. He is also the co-author of the Yoga and Mindfulness Practices for Teens Card Deck (PESI, 2017). As a frequent speaker at conferences including the Kripalu Yoga in Schools Symposium, Bridging the Hearts and Minds of Youth, the Omega Mindfulness in Education Conference, and the Yoga Service Conference, Argos is an important member of the yoga in schools community and a trusted expert with a foot in both the yoga/mindfulness and education worlds. His deep passion for empowering children and adolescents, and supporting other education professionals to do the same, is clearly evident in all aspects of his work. Financial: Argos Gonzalez is an adjunct lecturer with Hunter College C.U.N.Y. He is a speaker for Mindful Schools and receives compensation. Mr. Gonzalez receives a speaking honorarium from PESI, Inc. Non-financial: Argos Gonzalez has no relevant non-financial relationship to disclose. Mayuri Breen-Gonzalez, E-RYT, RCYT, is a nationally recognized presenter, trainer and instructor in mindfulness and children’s yoga, leading teacher trainings and continuing education seminars at renowned retreat centers such as The Omega Institute and IONS Earthrise Center. She has more than 25 years of experience practicing yoga and mindfulness, and provides therapeutic yoga classes to children and families as well as teaching yoga and mindfulness classes in schools and community centers. In her role as director of the School Yoga Project, (a Little Flower Yoga program that brings yoga and mindfulness classes to over 1800 children a week in New York City schools), Mayuri trains and mentors teachers, counselors and school support staff. She is a contributing author to Best Practices for Yoga in Schools, (YSC-Omega, 2015), published by the Yoga Service Council. Mayuri is also the co-author of the Yoga and Mindfulness Practices for Teens Card Deck (PESI, 2017) and Mindful Chair Yoga Card Deck (PESI, 2018). As an active member of the Yoga Service Council and the International Association for Yoga Therapists, Mayuri maintains a strong community of support and a commitment to continuous learning. Financial: Mayuri Gonzalez is the founder and co-owner of Prasanthi Studio Family Yoga and Wellness. She is the director of The School Yoga Project a program of Little Flower Yoga. She receives a speaking honorarium from PESI, Inc. Non-financial: Mayuri Gonzalez has no relevant non-financial relationship to disclose.